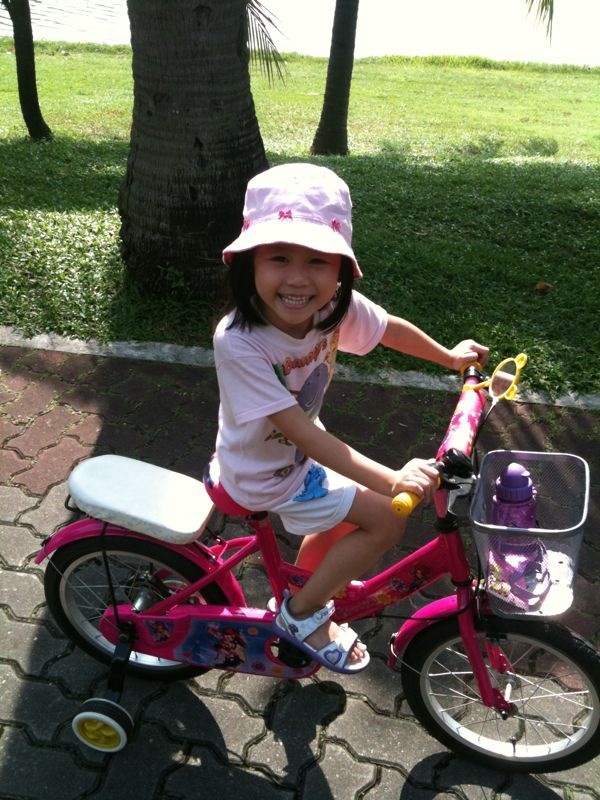 Anyway, daddy brought Dawn for her cycling trips again and see how this girl shines under the sun! Love her hat…looks like a Japanese? 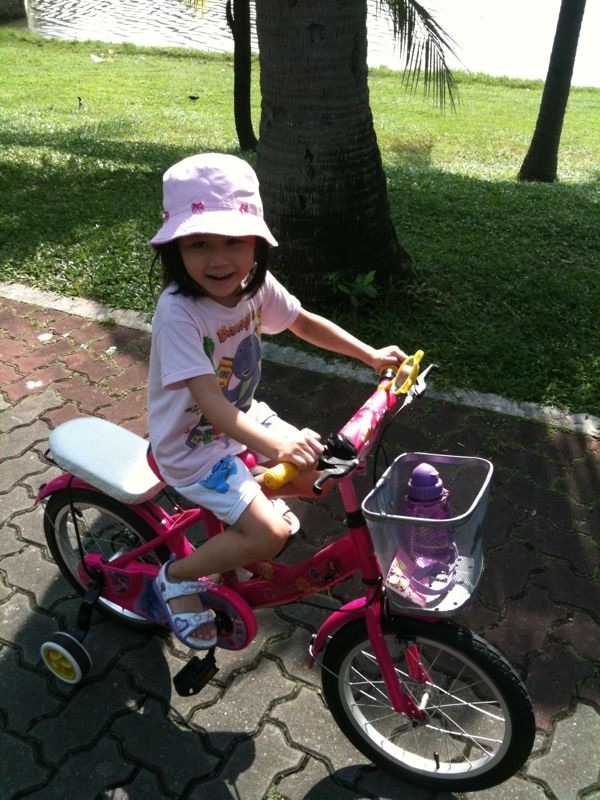 Daddy took this photo to show me how fast she can peddle on her bicycle. And he claims that he has to walk very fast or at times run after her! Due to Eva’s appearance, we had to ask Dawn to be understanding and that we have to stop our weekly family outing on the weekends for a month or so. Dawn is a very understanding girl and she looks forward to May (I was having confinement in April). And she keeps saying that we are going to the beach for picnic and sand play in May. We had so much things to do and the sand play only happened in the last weekend of May, at a very last minute decision on a Sunday morning. Phew, at least we honor our promises to her. Daddy is great! Even though it’s only a 30 mins stay in the park, he disregards the hassles and brought the whole family there! Yes, with little Eva. 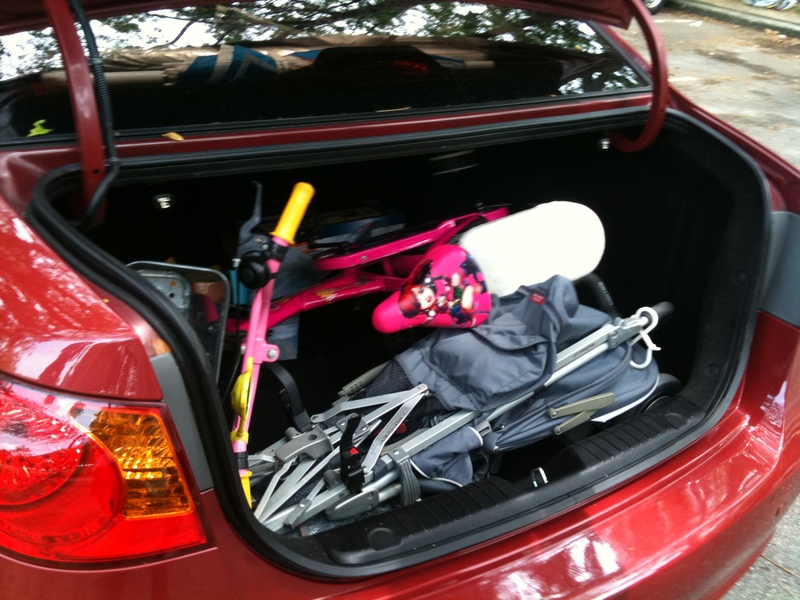 So off we went, packing Dawn’s bicycle & sand play equipment and Eva’s pram into the car boot. 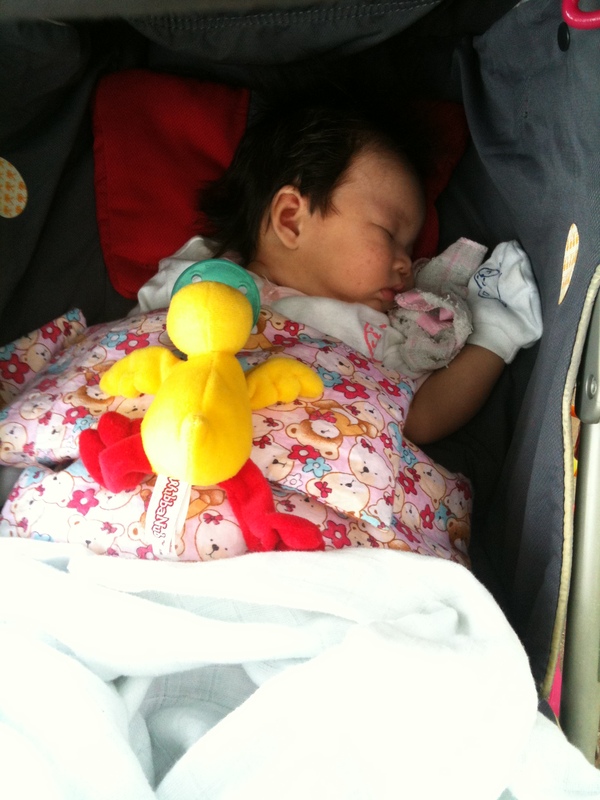 Of course little Eva can’t play with Dawn Jie Jie and she slept soundly under the shade and the sea breeze. I had to stay with Eva and also look after Dawn’s bicycle, and so hubby found a stool with a good shade for me to rest while waiting for them. This is how far I was away from them. Happy Dawn under the sun! 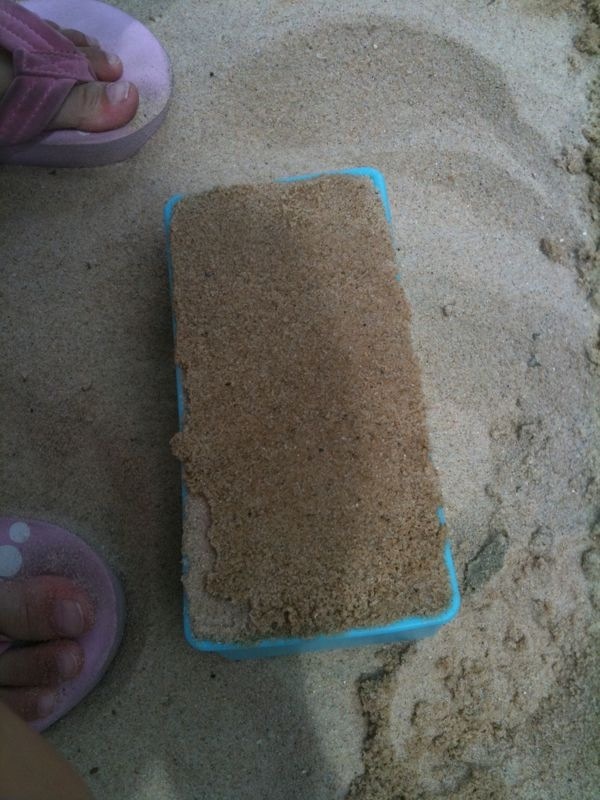 They didn’t have much time to build a proper sand castle (as we have to go back home for lunch), but Dawn’s has great fun. 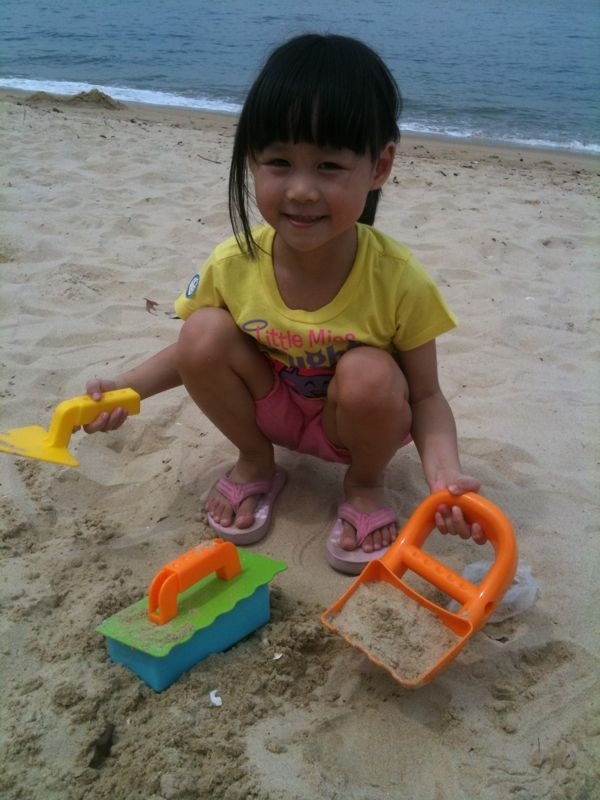 She’s proud with filling up the sand in one of the tool and brought to show me 3x! Love this girl! 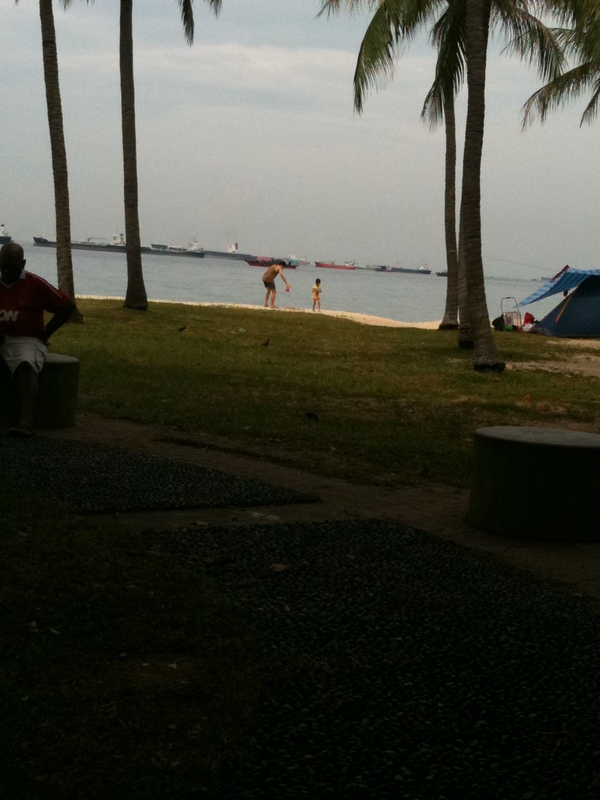 I realised as I become wiser (aka older), I am less of an outdoor person. 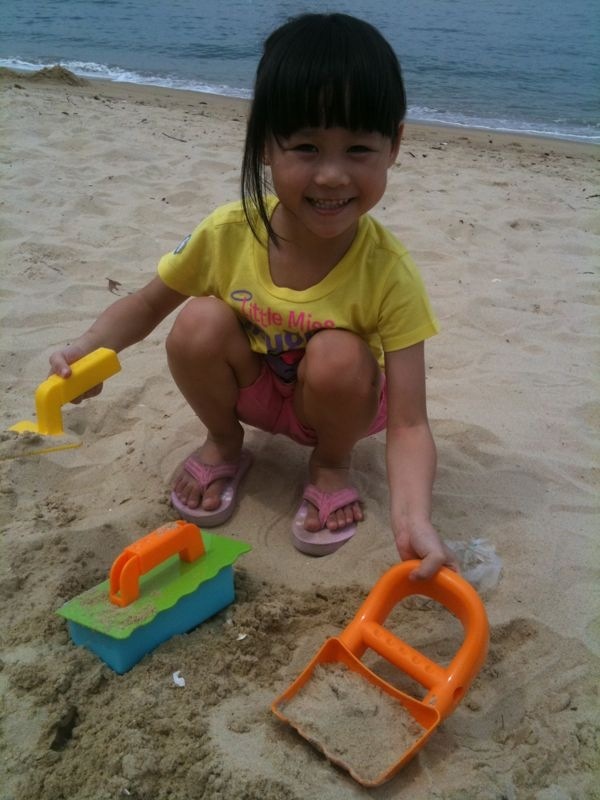 Used to love the sun so much, tanned until my friends call me “Orh lu lu” (means black/tan in my skin colour), love the beach and the water even though I do not know how to swim. 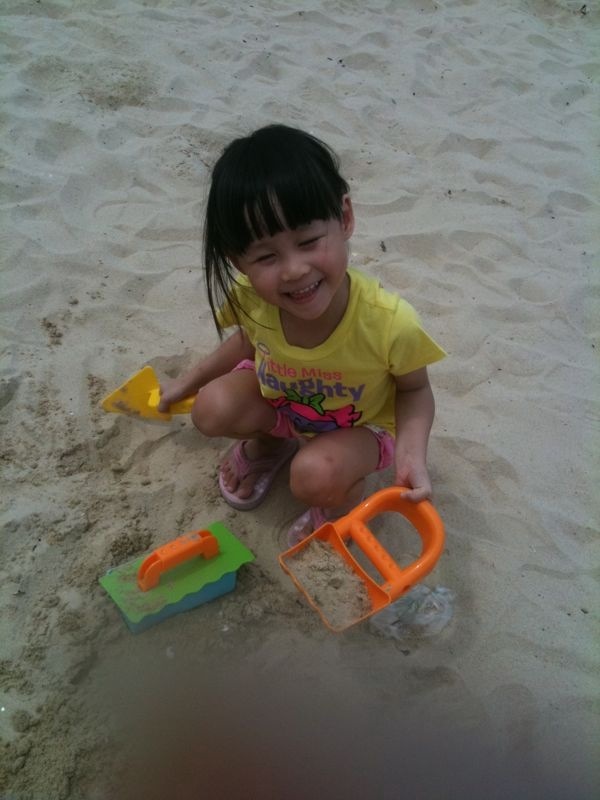 I even went to a sand treasure hunt thingy in Sentosa – digging for treasure balls in the sandcastles under the noon sun! How crazy was that? Now? Scare of sun because it can cause pigmentation on my face, hate the sweat running down my forehead and my body, hate the aftermath sweat smell on me and the insects or disgusting things that are lying on the ground. And I spotted a dead rat after sitting at the stool for a good 25 mins! GOSH! 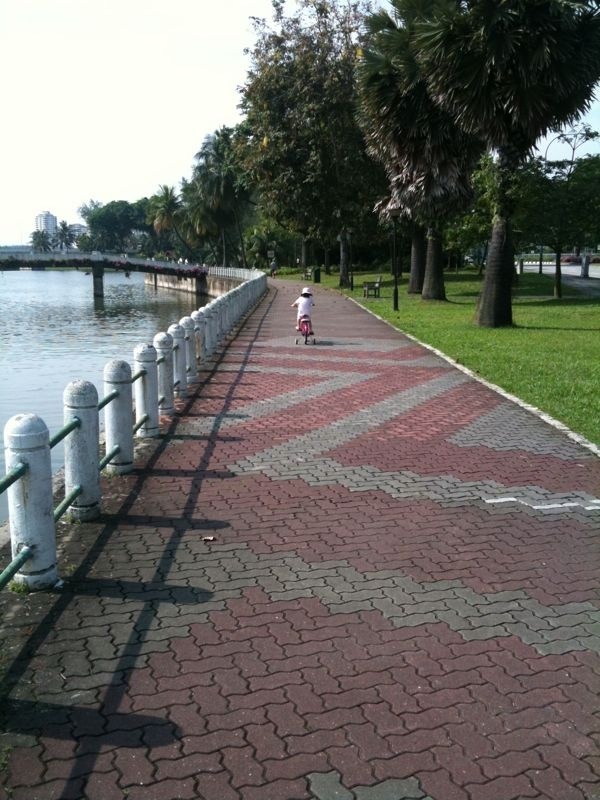 This entry was posted in Bzmommyhood, Dawn, Eva and tagged Dawn, Eva.